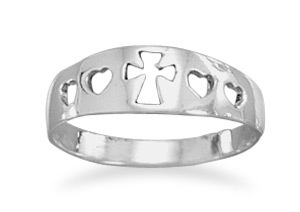 A .925 sterling silver ring with cut-out heart shapes and design cross at center. The band graduates from 6mm at top to 2.5mm at bottom and is available in whole sizes 5-9. Perfect as a purity ring or stand-alone Christian ring for women. The Bible repeatedly admonishes Christians to forebear one another wth love. "With all lowliness and meekness, with longsuffering, forbearing one another in love; Endeavouring to keep the unity of the Spirit in the bond of peace" (Ephesians 4:2-3). This ring is a symbol of Christian love. Apples of Gold Jewelry is a Christian-owned fine jewelry company. All jewelry comes with free shipping in the U.S. and comes with our 45-day return policy. We guarantee our Women's Cross and Heart Ring in Sterling Silver to be high quality, authentic jewelry, as described above.